Many eons ago, I started posting photos of my doll collection on DA just to show them off. I set them up in room boxes and posed them for photographs and the stories began. About three years ago I took a drastic move and ended up selling most of my collection. I am back in a spacious place now and have started the comics over. So here they are. They are egregiously silly, please do not expect anything serious from them. This was the picture I took to show I had a setup again. The next one will start the actual story. And I forgot about Sofia and Amber . 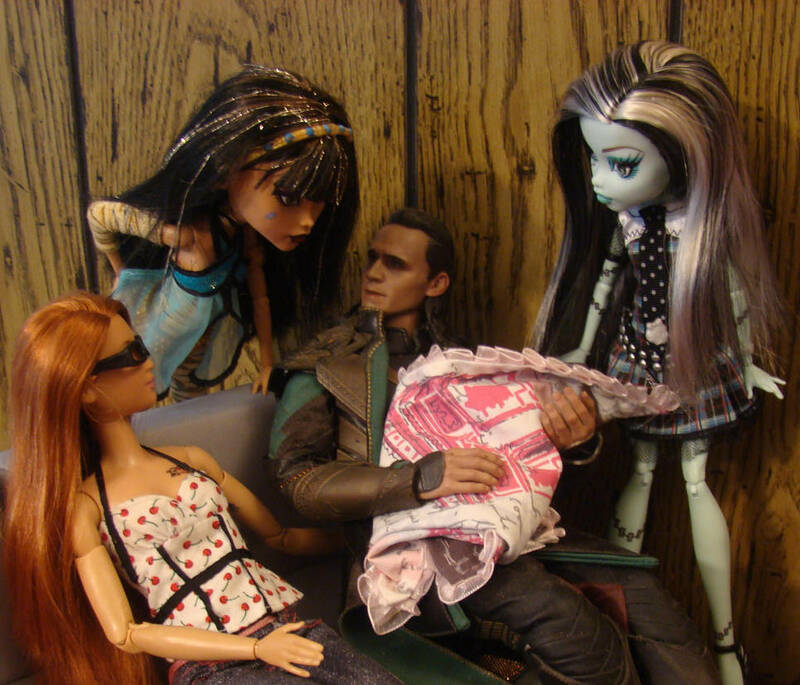 . .
After the Monster High reboot, everyone got new siblings -- all younger. The only pre-reboot sibling to make it through intact was Howleen Wolf. And even then, it looks like they shrank her a bit. I have a *good* Howleen, so I won't be shelling out for the new one. Now, I like having dolls of various 'ages', heights, and body styles. It lends itself to a more . . . uh . . . realistic (yeah, we're talking gods and monsters, but you know what I mean.) community. And most people have at least one sibling, unless they've disowned them. So Draculaura got one younger sister, Frankie got one younger sister, Lagoona got two younger sisters. Cleo got two younger sisters (I think the baby is supposed to be a girl. They don't really say.) and a younger brother. And Clawdeen, who was always famous for having a huge family, got a staggering five (including Howleen) siblings - one brother and four sisters. So I blended the pre and post reboot family. I always liked the punny names, so I could handle 'Pharrah', but I drew the line at 'Sandy'. That's the name the baby came with. I changed to 'Sabra' which is an Egyptian boys' name, but that would explain why the infant was wearing a crown when no one else was. I also decided to make him Nefera's son, which would explain why Lux got skipped in succession. The child dolls are not articulated well, but they have nice thick hair and their faces are decently painted. If I blended the Wolf family, that would be eight children in one family! I kind of like the idea of Loki mentoring all of these young gods and monsters.